8-lane international-level blue track to be the first of its kind in India. 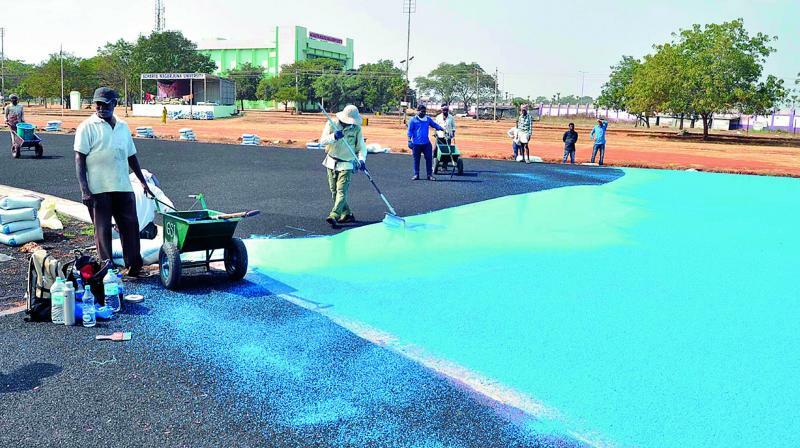 GUNTUR: The first international-level blue eight lane synthetic athletic track in India will come up in Acharya Nagarjuna University in Guntur. ANU is laying 400 meters eight lane synthetic blue running track on its campus. The work started on Tuesday and is expected to be completed by Sankranthi. ANU director of physical education Y. Kishore on Tuesday said that the total expenditure of this track is Rs 6.86 crore, of which the Centre has sanctioned Rs 5.5 crore. ANU will bear the rest. Mr Kishore said that most countries are using synthetic blue athletics tracks against conventional brick ones and ANU is the first in India to go in for this type of track. He said that imported polyurethane adhesive and recycled rubber granules are being used in this track which consists three layers. The track can last for 15-20 years and after that period it can be refreshed by changing only the top layer. ANU V-C Prof. A Rajendra Prasad and other officials visited the track and inquired about the progress of the work.